Finite Math is often a required course, taken by students who come with a weak math background and struggle with the subject. 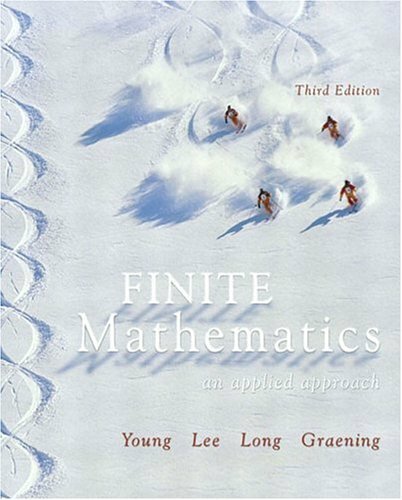 Young/Lee's Finite Mathematics: An Applied Approach 3rd Edition is written with these students in mind. Despite the excellent variety of drill, practice and conceptual problems laced with relevant real-world applications, students in finite math often struggle, prompting them to lean on the chapter's examples for help. In this text, the authors provide examples that are not just quick recipes to be applied to a particular problem, but rather they offer actual insight into the problem at hand, as well to the general concept being developed. The examples help the students retain important concepts and then apply them in the exercises that follow. Using color in a way that carries the student's eye into the exposition that surrounds an example, the student is led, gently, to generalization and understanding. Young/Lee have found that delicate balance between accurate, precise and useful mathematics and aiding the struggling student towards successfully learning it.